Remove neck and giblets and rinse turkey in sink. Place in a large roasting pan and stuff lightly (I stuff through the neck and legs). Rub with olive oil, salt and pepper. Bake at 325 for about 20 minutes per pound of turkey. Turkey should be 180 degrees. Saute butter celery and onion in a large frying pan. While they are cooking mix everything else in a large bowl. When onions are almost clear pour over bread mixture. 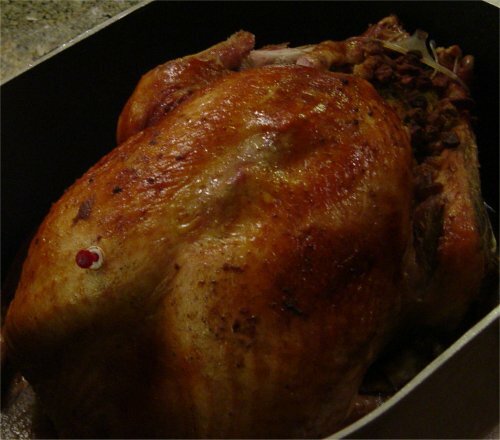 Stuff turkey and bake the rest in a covered 9x13 pan at 350 for 45 minutes. You can also cook in a crock pot on low for 3-5 hours.